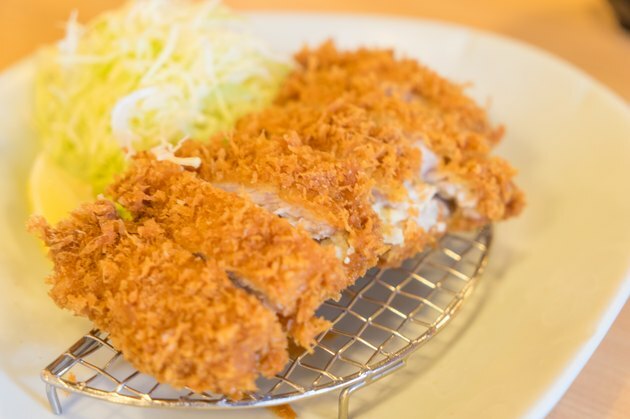 Although there are a number of different ways to reheat breaded pork cutlets, the best method is to quickly heat them in a hot oven, which will keep the meat from drying out during a longer cooking process. Breaded pork cutlets that are less than two days old will work best and retain most of their moisture, but older pork chops may dry out a bit, and the breading can be become too crispy for some. Line a baking sheet with a layer of aluminum foil. Lightly brush the aluminum foil with a light layer of vegetable oil or cooking spray. Place the breaded pork cutlets on the oiled baking sheet and tightly cover the pork chops with another layer of aluminum foil. Heat the pork cutlets in the oven for eight minutes. Remove the foil from the baking sheet and flip the pork cutlets over. Reseal the aluminum foil and heat the pork cutlets on the other side for an additional 10 minutes. Remove the baking sheet from the oven and allow the pork cutlets to rest, keeping them covered for five minutes. Transfer the pork cutlets to a warmed serving platter and serve while hot. If the pork cutlets get too dry during the reheating process, serve them with a lemon or lime wedge for a bit of extra moisture. Alternately, serve the pork cutlets with homemade or store-bought apricot preserves or mint jelly. Use light vegetable oil or light cooking spray to reduce calories and fat content if desired. Avoid using any sort of liquid marinade to soften breaded pork cutlets during the reheating process, as it will cause the breading to become soggy and separate from the pork cutlets.